Five Things Teachers Can Do to Improve Learning For ELLs For the New Year | So, You Think You Can Teach ESL? I came across this excellent page on Colorin Colorado’s website. Colorin Colorado is an ELL website based in the United States, and they work with ELL students and families. They have plenty of tips and resources for teachers and parents! I’d like to share these tips with you! 1. Increase ELL students’ English language production and peer interaction. Specific and measurable goal: ELL students will verbally demonstrate their English speaking abilities in classroom work at least three times a week. There are two key items ELLs need in order to improve their English — time and practice. There is nothing teachers can do to rush English acquisition, but there are many ways to provide opportunities to practice English in the classroom. If activities are structured to support student-to-student or group interaction, ELLs are required to use English to explain concepts and contribute to the work. This gives teachers an opportunity to gauge what the student has learned, and it demonstrates student progress in English language development. Teachers can also informally assess for correct use of language structures and academic vocabulary. If ELLs are having difficulty with phrases or vocabulary, the teacher will be able to offer guidance or further instruction to support language development. See the Hotlinks section for links to ideas on interactive learning activities. 2. Explicitly teach English language vocabulary and structures. Specific and measurable resolution: I will identify, teach, and post key academic vocabulary and structures for one content lesson each day. Teachers play a critical role in supporting language development. Beyond teaching children to read and write in school, they need to help children learn and use aspects of language associated with the academic discourse of the various school subjects. They need to help them become more aware of how language functions in various modes of communication across the curriculum. They need to understand how language works well enough to select materials that will help expand their students’ linguistic horizons and to plan instructional activities that give students opportunities to use the new forms and modes of expression to which they are being exposed. Teachers need to understand how to design the classroom language environment so as to optimize language and literacy learning and to avoid linguistic obstacles to content area learning (Wong Fillmore & Snow, p. 7). Content teachers can begin by reviewing a content area lesson and identifying not just the vocabulary that every student needs to know, but other vocabulary words and grammar structures that ELL students may not be familiar with. See the Hotlinks section for resources on how to provide explicit instruction on English vocabulary and structures. Specific and measurable goal: I will elicit background knowledge from ELLs in one content area through a variety of activities, including questioning and graphic organizers. Learning something new is like stacking building blocks. The more you have, the higher you can go. It is not always apparent what building blocks ELLs come with due to language barriers, and sometimes ELL students don’t connect their previous experience with the lesson currently being taught. That is where the teacher’s skill at drawing on background knowledge becomes so important. Teachers can work creatively to elicit background knowledge from students on content topics in order to increase comprehension of the material. This may be as simple as taking the time to do a “K/W/L” (Know, Want to Know, Learned) chart, or as individualized as asking questions about the topic: “Has anyone ever visited the jungle? A jungle is like a rainforest. What do you see in a jungle?” Students can share their knowledge and see how it is connected to new academic information. See the Hotlinks section for more resources on strategies to increase connections with student background knowledge. Specific and measurable goal: Teacher will contact one ELL parent each week to share information on his/her student or to inform the parent of a school event. No matter what language you or your students’ parents speak, parental support is a big key to academic success. ELL families are often at a disadvantage when it comes to supporting their child because of language and cultural barriers. It can be easy to interpret ELL parent “no shows” as a lack of interest in education; however, very often ELL parents want their children to succeed as much as any other parent but are unable to participate to the same extent that other parents participate due to these barriers or their work schedules. Regular, open and friendly communication from the teacher can make a big difference in ELL parent participation. It can feel daunting for an English speaking teacher to call a non-English speaking parent, but usually there is someone in the family who speaks enough English to interpret the message for the parent, or the parent speaks enough English to understand a simple message. It may also be possible to get help from a bilingual school staff member to assist in making a quick phone call. ELL parents will be very pleased and excited to hear positive news about their child and will feel more comfortable asking questions and visiting the school in the future. The more informed the parents are, the more likely it is that the student will get support at home and parents will have the information they need to help their child be successful. 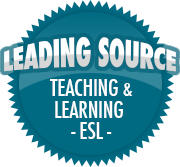 See the Hotlinks section for links to further resources with specific ideas for ELL family outreach. Specific and measurable goal: Students will engage in a weekly writing activity that will focus on developing a certain skill such as creative vocabulary use, the correct format of an essay or the peer editing process. The ability to write effectively and accurately to convey a message is a very important skill for a college student and in most careers. However, it often seems as if the curriculum is largely focused on developing reading and math skills. Of course, these are very important too, but students need to have many positive opportunities to develop writing skills in a variety of formats in order to strengthen their communication skills. For ELLs this is particularly important. Depending on their writing skill level in their first language and their English language abilities, writing may be frustrating. Students need to engage in a variety of writing to develop an understanding of different types of writing and to identify their strengths and weaknesses as a writer. I could not write better tips than these. They’re focused on helping ELLs improve their speaking, reading, writing, comprehension, and encourage parent involvement at home!